Yellow Bait House in Key Largo is your one-stop-shop for all of your angling and fishing needs! Yellow Bait House Carries a full line of Fishing rods, tackle, live and dead bait and Red Rum Fishing Shirts. These include the famous Ruler Sleeve fishing shirts, Performance Freediver Shirts and Mermaid Performance Crop Tops. All of the Red Rum Shirts are UV 30 sun protective, fast-drying and keep you feeling cool in the tropic heat! Stop by today to checkout Key Largos best bait & tackle shop and get your hands on some Red Rum fishing shirts! Live bait..tackle..Rod repairs and rentals…Expert Advice from local captains. The Yellow Bait House. Captain Hook’s in Marathon Carries a FULL line of Red Rum Shirts & Hats! These include Red Rum’s famous Tropical Hats, Red Rum Stickers & Decals, Mens Fishing Shirts, and Ladies Crop Top Rash Guards, including the famous Mermaid design! The NEW Ladies Mermaid Crop Top Rash Guards have been a smash hit this summer! These long sleeve crop tops are UPF 30+ Sun Protective and quick-drying. They are truly the perfect shirt for diving, fishing boarding or boating! Our other most popular shirt design which will be in-stock at Captain Hooks is the Ruler Sleeve Grouper Shirts! These fishing shirts are also UV 30 Sun protective and fast drying. These products are sure to add some swagger to your tropical lifestyle clothing collection! Stop by today and check out the new gear for yourself! 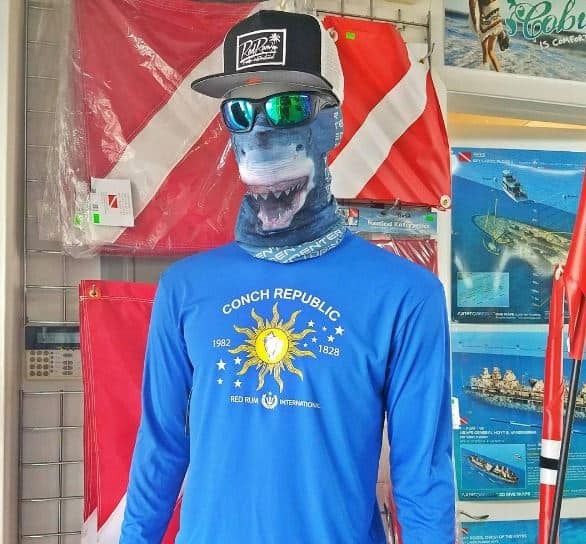 In addition to providing excellent customer service, Scuba Outlet in Key Largo is known for their selection of diving and spearfishing apparel including performance shirts and hats by Red Rum International! They carry the most extensive line of Red Rum gear in the Upper Keys including the famous grouper shirts and performance crop tops! They also sell other top quality dive, snorkel, spearfishing and lobstering gear and offer Scuba Diving certification classes. Their Key Largo location is the premier spot to stock-up on your dive and Red Rum gear and hats before heading south on US1 through the FL Keys this lobster season! Stop by today to get your hands on some Red Rum and Gear-Up for Lobster Season! Watersports West carries Red Rum Lobster Shirts, Ruler Sleeve Shirts and more! Watersports West is located close to the water and Indian Rocks Beach. They NOW carry the Red Rum Lobster Shirts, Ruler Sleeve Fishing Shirts, Digital Camos and more! These shirts serve as perfect rashguards as they are UV 30+ sun protective, fast drying and are made from non-irritating fabric. They can be worn under the water while spearfishing, lobstering and diving or above the water while surfing, paddleboarding, kitesurfing, fishing, etc. “We are active in the sports we promote and we are experts in all aspects of these watersports. We were started in 2001 by Steve and Mary LeVine and our goal is to bring our customers the latest watersports equipment from the best manufacturers”. They also carries an awesome variety of gear and apparel for kayaking, paddleboarding, kitesurfing, wakeboarding, skimboarding and windsurfing. Their selection of additional men and ladies apparel is also abundant including boardshorts, bikinis, t-shirts and more. With sales running weekly, it is always a good time to stop by and see what’s new! 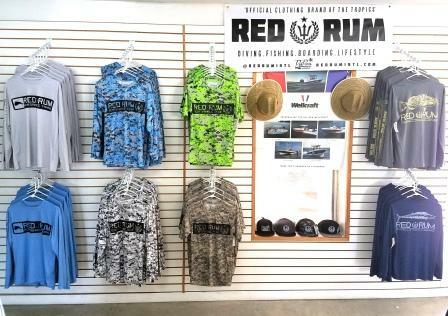 Red Rum is proud to announce that Force E Scuba Shops in Riviera Beach, FL and Pompano Beach, FL have added the Red Rum Waterman’s Hats, Ruler Sleeve 2.0 Grouper Shirts and Performance Long Sleeve Freediver Shirts to their apparel selection. These fishing and spearfishing shirts are UV 30+ sun protective and awesome for being either on or under the water. “With nearly 40 years in the business, we could have gone in a different direction by putting dollars above all else, but that’s just our way. Our success is based on our love of snorkeling and diving, the ocean, conservation, education and community. We have had a hand at shaping the South Florida dive community as it is now. We had in integral part in building the popularity of the Blue Heron Bridge, one of the most famous U.S. dive sites. In addition, we encourage our customers to be environmentally aware by hosting regular reef clean up, lionfish round ups, and educational seminars. And last, but not least, we like to party. Why is this so important? Well, diving is fun, and we should get together to celebrate it”. Carry a wide selection of scuba diving and snorkeling equipment. The best in the business in fact. Force-E is a PADI 5 Star Instructor Development Center with three Course Directors and 15 professional instructors on staff. The Red Rum Spearfishing takes off again, this time for Man o War Cay, Abaco, Bahamas for some freediving and some fun! Nice shot on a Nassau Grouper, Margate Snapper and Hogfish! Red Rum Clothing NOW Available at Sunrise Dive, Fish, Surf Shop! 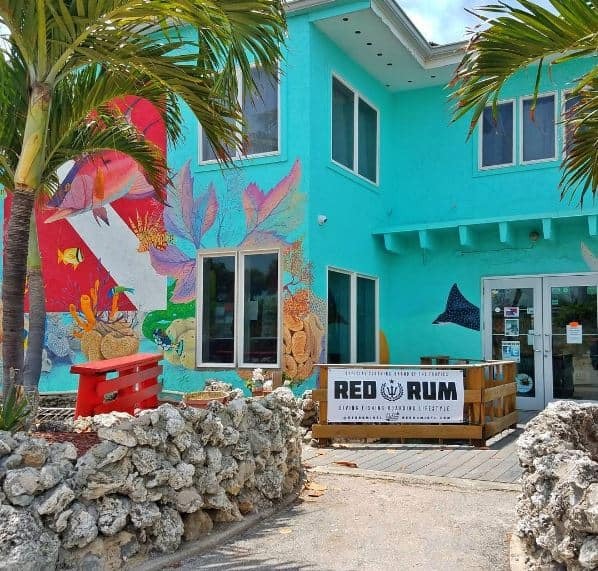 Red Rum Clothing is NOW Available at Sunrise Marina‘s Dive, Fish, Surf Shop in Cape Canaveral, FL! They have everything you need for a fun day on the water. Their tackle store is stocked with the best fresh & frozen baits and the latest offshore lures & tackle. They also have cool clothes and nautical gifts for your home to make you feel like you are on vacation every day! The landmark store is across from Grillz Seafood Restaurant and is a fan favorite before hopping on – or – off of a cruise to the islands! Products that Sunrise will be carrying include Red Rum’s famous Tropical Hats, Red Rum Stickers & Decals, Mens Fishing Shirts, and Ladies Crop Top Rash Guards, including the famous Mermaid design! These products are sure to add some swagger to your tropical lifestyle clothing collection! Stop by today and check out the new gear for yourself! Fishing in the Florida Keys is unlike any other fishing experience in the United States. Excluding minor outlying Islands and territories, these particular keys offer some of the most abundance in fishing fair. Everything from blue marlins to yellowfin tuna can be found at one point or another in these tropical waters. The Waters of the Florida Keys are fed by the Gulf Stream which originates in the Gulf of Mexico and passes through the Straits of Florida continuing all the way up the east coast of the United States into the North Atlantic Ocean. This aquatic superhighway is the route in which many of these pelagic species travel. It is a popular thought, that excluding the reef fish of the Florida Keys, most fish are transient and do not call the waters off these tiny Islands home. These species come from places in the Caribbean Sea, Gulf of Mexico and beyond; in search of something more– or perhaps just following biological patterns. Either way, we are just Fishing in the Florida Keys. Fish for thought! Red Rum Tropical Lifestyle Clothing is NOW available at Suncoast Surf Shop on Treasure Island, FL! 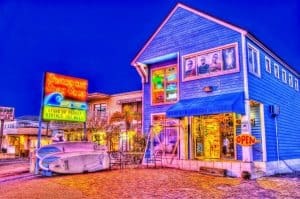 This legendary shop has been holding it down for local surfers and beach-goers for over 50 years! Suncoast offers a full assortment of beach and surfing apparel, along with all your favorite Surf, Skim, Skate, and SUP boards for sale and rent! The staff here guarantees to get you on the right board! Also, make sure to follow @suncoastsurfshop to keep up on surf forecasts and fun boarding events, such as the Monday Night Paddle. Red Rum products now stocked at Suncoast Surf Shop include our famous Tropical Hats. Multiple styles of the Mesh-Back Performance Hats, and the Classic Red Rum Floral Designs are now available! The Ladies Mermaid Crop Top Rash Guards are another new item available! These long sleeve crop tops are UPF 30+ Sun Protective and quick-drying. They are truly the perfect summer rash for your tropical lifestyle, whether you’re boarding, boating, or beaching! The Digital Camo Performance Shirts are also re-stocked! Now available in Blue and White, with both Short-Sleeve and Long-Sleeve options. These UV-Protective Performance Shirts are UPF 30+, Anti-Snag, and Anti-Stain. Making them perfect for before, during, and after a fishing trip or boarding session! Stop by Suncoast today to pick up some true local gear from this truly local shop! Red Rum Fishing Shirts are NOW Available at Murray Marine in Key West, FL! For over 46 years, the family-owned and operated marina has proudly served Key West and its surrounding areas with dock space, marine storage and repair, and with a full-service store that provides ice, beer, snacks and now fishing apparel! Red Rum International is a locally based brand out of Florida whom has its roots in Islamorada, FL. We provide a full line of sun protective and performance fishing apparel for both men and women including shirts, hats, decals and more! “I’m very glad to try something new”, says owner and founder Lee Murray. He is usually the type of guy who maintains an ‘if it ain’t broke don’t fix it attitude’, but in this case nothing was broken but it surely could have been fixed. His last apparel vendors gave-up on him but Red Rum will not. Among the NEW apparel additions include the Red Rum Ruler Sleeve Fishing Shirts, Digital Camo Shirts, Straw Hats and Performance Mesh Hats. 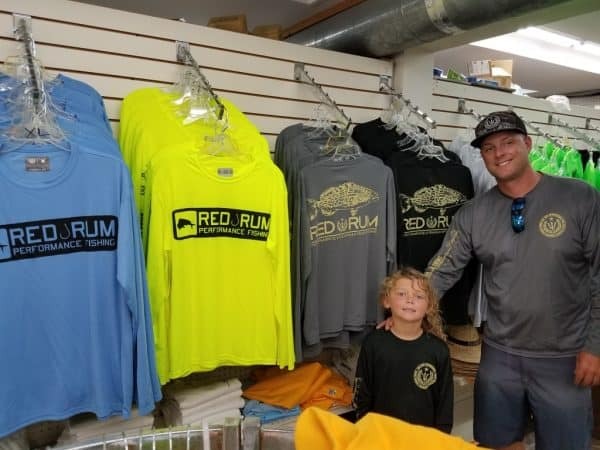 Be sure to stop by before your day on the water and load-up your tropical lifestyle gear by Red Rum at Murray Marine!